JACKIE MINNITI: The Greatest Generation will soon be no more. Each day, we lose 360 WWII veterans. Approximately 555,000 remain, and the VA projects that in 20 years, those too will be gone. And their stories, a treasure trove of living history, will disappear with them. My father was a veteran of WWII. As a Baby Boomer, just one generation removed from that war, I thought I knew a lot about it. 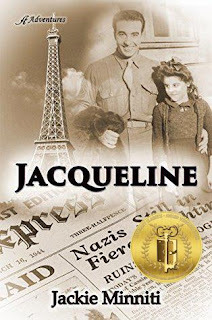 But it wasn’t until I decided to write a book about a little French girl named Jacqueline that I truly understood the amazing contribution made by our Greatest Generation. In 1944, four years before my birth, my dad was a handsome soldier with the 127th General Hospital. Shortly after D-Day, his unit arrived in Rennes, France to set up a military hospital. There he met Jacqueline, an inquisitive 10-year-old who took a liking to him. She began following him from the barracks to the hospital and back again. While neither understood the other’s language, they learned to communicate by teaching one another a few words and phrases punctuated with exaggerated gestures. Soon, a beautiful friendship blossomed, and Dad promised her that if he ever had a daughter, he would name her Jacqueline. This was the only war story my father was willing to share. He told it so often, sometimes with misty eyes, that it became a part of our family lore. After I wrote my first book, Dad began hinting that I write one about Jacqueline. Never having written historical fiction, I realized I needed to find out a lot more about WWII. I plunged into the research, and the more I learned, the more I realized how little I actually knew. But most of all, I was awed by the incredible bravery, selflessness and sacrifice of the American GIs. Dad passed away six months short of his 100th birthday, and I feel tremendously blessed that he died knowing his story would live on. It’s essential to preserve these stories so future generations will know about the sacrifices made by our military and realize how fortunate they are to live in the Land of the Free. So many people lack even a rudimentary understanding of American history, and what they don’t learn from history, they’re doomed to repeat. 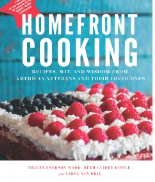 I was recently honored to have my dad's story included as the lead selection in Homefront Cooking, a wonderful collection of stories and recipes that honors the service of American veterans. Part of the proceeds of this book will be donated to the Robert Irvine Foundation, an organization that supports our military personnel and first responders. We owe these disappearing warriors (and all our veterans) a debt we can never repay. Do you know someone who fought in WWII? If so, consider yourself fortunate. You still have access to a piece of living history. Make the most of it! 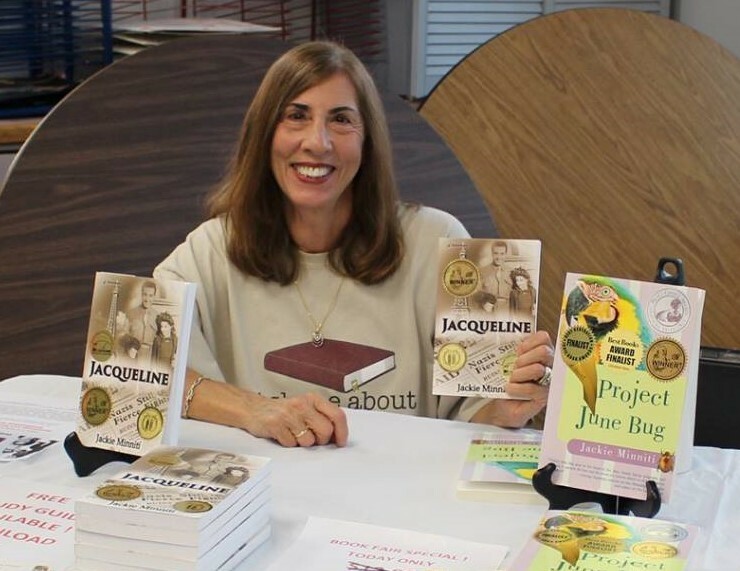 Jackie Minniti was born and raised in the heart of New Jersey where she spent 25 years as a classroom teacher and was a contributing education writer for the Courier Post. After retiring from teaching, she moved to Florida’s west coast and turned to writing full-time. She was a columnist for The Island Reporter in St. Petersburg, Florida and writes a blog featuring Florida authors. Her first novel, Project June Bug, the story of a young teacher’s efforts to help a student with ADHD, won eleven literary awards, including Premier Book Awards “Book of the Year.” Her middle grade novel, Jacqueline, is a WWII historical set in France. It received an Eric Hoffer Book Award, the Literary Classics Book Awards gold medal for historical fiction, and first place for middle grade fiction in the Florida Writers Association Royal Palm Literary Awards. Several of her stories have been included in Chicken Soup for the Soul collections. Jackie lives on Treasure Island with her husband and two rather noisy macaws, but she frequently travels back to New Jersey to visit her children and grandkids. 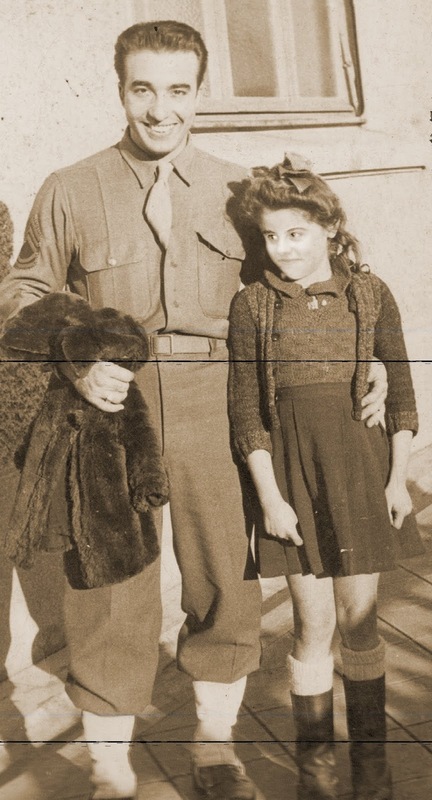 Jackie, your father’s story is so touching and sweet, especially against the backdrop of the horrors of war. Thank you for sharing it here. We owe so much to those who fought in the Second World War; it’s an honor to read their stories. Thanks, Joan. I agree. They were truly the Greatest Generation! My father, still going strong at 93, was in the Navy during WWII, and fought in the Pacific, assigned to the aircraft carrier St. Lo. His ship was hit by a kamikaze pilot in the Battle of Leyte Gulf, and sank. He was one of the last men to leave the ship, helping many others to safety before requesting permission to abandon ship himself, alongside a couple of officers and the captain. He never talked much about his time in the service, and sometimes, as I was growing up, he showed signs of what we would now recognize as PTSD. Not that he would admit that he had any problems, even today. We had a complicated relationship as I was growing up--I wasn't the "good" daughter--but with time, distance, and my own historical research, I have come to understand the heroism he and his whole generation showed in a war of unimaginable scope. Thank you, Jackie, for preserving your own father's story. They all seemed so old to us already when we were kids, but so many of them were barely more than kids themselves when they were asked to step up. They stepped up with incredible courage. So true Gigi, they were babies when they went off to war. My dad had reunions with his unit all through his life. Later on he wrote a number of pages of his "memoir"--I was astonished to see how much of it had to do with those men and the war, and how few about his family and life after WWII! It was probably the most intense and "historical" time of his life, Roberta, so he thought that would be the most interesting part. I would have loved to read about how he dealt with the coming home and standing down from warrior mode, and what it was like raising a little girl in a post-war world, when Dad knows how horrible things can be, and the children are so innocent. Gigi, you are so blessed to still have your dad with you. Please tell him that I thank him for his service. One of the things that struck me most when I was doing the research for "Jacqueline" was how young these men and women were when they went off to war. Many were leaving home for the very first time, but they were willing to make the sacrifice for a cause they believed in and a country they loved. This, to me, is the real definition of courage! Thank you so much for sharing your story - your father's story - with us. I'm always looking for middle grade novels for my young friends, so this one is going on the list! My father served in WWII but didn't see combat - he ran a telegraph relay station in a remote part of India, or something like that. Thanks, Edith. 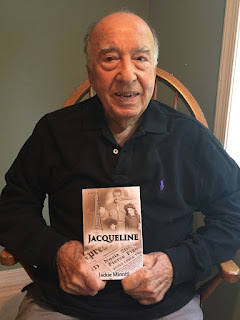 One of the reasons I wrote "Jacqueline" was to help young readers understand the sacrifice that was made for the freedom they now enjoy so they can appreciate how fortunate they are to live in this country. As a former middle school teacher, I've seen how history has taken a backseat since it became lumped in with social studies, and I'm a believer that what we don't learn from history, we're doomed to repeat. In order to help kids get the most out of reading "Jacqueline," I've put together a comprehensive study guide with all kinds of enrichment activities to go along with the book. It's available as a free download on my website: www.jackieminniti.com. My father was in the Navy during the war; like thousands of other boys he had dropped out of school to enlist. About all he ever said was the name of his ship. If I had to guess what he did on the ship I would guess machinist and I am so sorry now that I really don't know more. I know exactly how you feel, Judi. When I was writing "Jacqueline," my dad opened up a little about some of the things he experienced, but I wish I could have gotten him to tell me more. He tended to steer clear of the more painful memories and focus on the few happy ones, but I'm thankful for the little pieces of the story he shared. Congratulations on your WWII book! It will make the war much more immediate to YA readers. My father served on a destroyer in the Pacific. He never talked about his experiences, other than to give my son the shark knife he'd carried in his life vest. Immediately after the war, he was stationed in San Francisco, where he and my mother dated. He DID enjoy talking about their SF courtship. How wonderful that your son has such a treasure! After the war, my dad got rid of everything except the photos he took in Rennes. I once asked him about his dog tags because I wanted to give them to my son, but Dad just shrugged and said they were lost. Jackie, how wonderful that you wrote this story and your dad was alive to appreciate it! I may be way past my middle grade years, but this sounds like I story I would enjoy reading. My dad was also a WWII veteran--infantry--part of the effort to liberate the Philippines, starting in New Guinea. He told very few stories of his time spent in the war--what we learned we mostly heard while the uncles and my dad were talking, if we kept quiet in the background. He too suffered from PTSD and endured nightmares to the end of his days. They may have been young, but they were courageous beyond belief--then expected to come home and shrug it off or bury it deep and get on with their lives. And so they did. They surely were an amazing generation. I had several uncles who served, and only one spoke of his war experiences. He was an air force pilot whose plane was shot down over Germany. He was captured and later escaped from a POW camp. I remember him crying the few times he talked about it. This made such an impression on me as a child, because I'd never seen a grown man cry. But he went on to live a good life in spite of it all. We do not have to let all warrior stories slip away. There are other generations--our brothers, husbands, sons and grandsons--who have been to war, too. It might help some of them if we listened to their stories, as well as those of the "Greatest Generation." Heaven knows, the greatest generation didn't seem so great when they were turning Vietnam era vets away from the VFW for various spurious reasons. They could all use good listeners who coax them to talk about their experiences. Last Memorial Day, I was invited to give the keynote speech at the local American Legion, and I spoke about the importance of preserving these stories for future generations. I saw so many of the vets in the audience wiping their eyes. When I was finished, several said they planned to share their memories. I hope they followed through! Gigi, it seems as if all the war memorials, while honoring those who served, those who never came home, and those who came home wounded in whatever way--well, we're still building memorials and our young people are still going off to fight in 'engagements' and whatever other euphemisms the politicians come up with to say 'war.' The least we can do, when they come home, is to hear them--to listen--and let the younger generations understand what 'glory' really means. My father also served in WWII. He was very young and was drafted out of college when he was 18. He spent his 19th birthday on a ship heading to the Pacific and served in New Guinea and the Philippines. He was Army and stayed in the Army Reserve for over 30 years. He rarely mentioned his service during that time and my mother said he didn't talk about it to her much either. They had dated in high school and married after he was discharged in 1946. I agree that these warriors are mostly gone at this point. My Dad passed away 10 years ago with advanced Alzheimer's. Last fall, I was lucky enough to visit the National Museum of the Pacific War in Fredericksburg, TX. It is really very detailed and interesting. I learned a lot. Thank you for sharing your father's story with us, Jackie. And best of luck in your writing. Thanks, Kay. I'm sorry that your dad is no longer with us, but he has made his mark on history, something that time or Alzheimer's can never erase. Thank you, Jackie. I intend to look for "Jacqueline", for myself and possibly to give to one of my sisters who is a middle school teacher. She's always on the lookout for good historical fiction for her classroom library. My dad was a WW II Navy vet, serving mostly in the Pacific, especially the Philippines. He talked to us a lot about his friends, including some residents of the Philippines. To this day, I feel an attachment to the Philippines. However, he didn't talk about his actual war experiences, which I didn't realize until I was in high school. I was studying World War II in my World History class. I asked Dad some questions about his war experiences. He started to speak, then burst into tears and left the room. At that point, he was probably around 42 years old. He died at 55. Many years later, my mom told one of my sisters that for the first few years of their marriage my dad often woke in the middle of the night screaming, and drenched in sweat. I'm the oldest child but I have no recollection of this. I recently retired from a municipal job where one of my responsibilities was to apply property tax exemptions for wartime veterans. Over the years I saw the number of WW II veterans dwindle. Whenever I met a WW II vet in person, if he was a Navy veteran I asked where he served, what ship he was on, etc. I never did meet anyone who served with my dad. Earlier this spring, a 95 year old Navy vet told me he was lucky enough to not be sent overseas , when I asked where he served. A couple days later he returned to my office and said "I have something for you", and he handed me a couple of pages of information he found on line about the ship my dad was on! I got all choked up! What a wonderful story, Deborah! I'm glad you had a chance to learn a little about your dad's experience. I wish I'd been able to get my father to share more of his experiences with me, but I'm thankful for what I was able to find out. It's hard to imagine how difficult it must have been for these brave men and women to live with their memories all bottled up inside for so many years! I'd be so happy to have you share "Jacqueline" with your sister. I was a middle school reading teacher in my "former life," and I love to hear that teachers are using my book in their classrooms. Please tell your sister that I've created a study guide that teachers can use in conjunction with the novel. It contains pre- and post- reading activities, skills worksheets, and chapter-by-chapter activities, all cross-referenced with the Common Core standards for language arts/literacy(4-8) and social studies/history (6-8). The study guide is available as a free download from my website:www.jackieminniti.com. My father was in the Canadian Navy during WWII, escorting people and merchandises from Canada to England, Scotland and Ireland. As most of your fathers, he didn't like to speak about it but he talked a little about the cities visited between missions. That's why , when visiting those places myself, I took lots of pictures to show him how his help had contributed to the rebirth of those devastated cities. Jackie, I'm always interested in a good book of this period and yours seems a very good one. Danielle, I'm sure your dad appreciated your pictures and having the opportunity to see the difference he made. My father had the chance to return to France, and the trip gave him a lot of satisfaction. He was also awarded a medal by the French government thanking him for his service. It was one of his treasures. This is so wonderful, Jackie, and what a treat to read your story, and all of the comments! Yes, my dad was in the battle of the bulge, and was taken prisoner, and I know a little about it, but I wish I knew more. When I was writing "Jacqueline," my dad talked about the Battle of the Bulge. He was working at the hospital in Rennes, and he said they were working 18-hour shifts to deal with the number of wounded. He told me that he saw the medics wheeling in two stretchers - one with an American GI and one with a German soldier. He said he thought about how strange it was that these two men had been trying to kill each other a few hours before, and now the hospital personnel would be fighting to save both their lives. I was so struck by this tory that I worked it into the book. If you do still have living relatives who fought in the war, visit them, take a recorder and get them to share memories. An enormous treasure trove of great stories has been forever lost. This is SO true! And this goes for veterans of all wars. Their stories are a window into what really happened - a firsthand account of history without the taint of someone's personal or political agenda. My mother's two brothers both severed on the Pacific front, one in the Navy and one in the Air Force. I keep a photo of the eldest, my Uncle Bill, in uniform, on the writing desk in my living room. Neither of them ever talked about their experiences but looking back now, I can see things in their lives and in their behavior that very likely were results of those experiences. Another uncle on my dad's side of the family also served in the Pacific, in New Zealand, and the only thing he ever said was that he couldn't bear even the smell of lamb! Apparently all they ate aboard ship was mutton. Now, I certainly wish I had known to ask more. Jackie, your book sounds like a wonderful resource for middle grades, and I'd like to read it, too. I want to know Jacqueline's story! So glad your dad got to see it published! Thanks so much! One of the proudest moments of my life was when I put that book in my dad's hands on his 99th birthday. It's a precious memory I'll treasure always. I love that picture of your dad and Jacqueline. They both look so pleased, and it's a reminder that friendships can emerge under the most difficult of circumstances. I don't think I know any WWII veterans--my own father served stateside at a base hospital during Vietnam. So for me and so many others, books are the primary source of information about the war and the Greatest Generation. Thanks, Jackie! That was one of my dad's favorite pictures too. He told me that Jacqueline was "like a precious gem in a very dark time." When the publisher asked me for input about the cover, I sent the picture and asked if it could be included. I was thrilled with the way it turned out - and so was Dad! Jackie, welcome to Jungle Reds! Can I ask what happened to Jacqueline after the war? My second cousin's husband is a WWII vet and he was honored by France at a ceremony in Florida about two years ago. He was at Normandy on D-Day! Dad and Jacqueline lost touch after the war - until 1959 when she made a surprise visit to my father's pharmacy in NJ. That's when I met her. She had married an Italian architect and was honeymooning in New York City. She'd kept my dad's address all those years. I remember her as this stunning, very fashionably dressed woman who looked nothing like anyone in our neighborhood. I was pen pals for a time with her step-sister who lived in Quebec. Unfortunately, we lost touch over the years. I did an exhaustive search for her when I decided to write the book, but I couldn't find a trace of her anywhere. My last family member who served in WWII died a few weeks ago, my Uncle Rich. He was a B-29 pilot in the pacific theater. I hope her children made a record of his experiences. I wish I had done that for my father, a navel officer in the South Pacific too. My condolences on the loss of your uncle. Ann. I still have one uncle who's a veteran - my dad's younger brother, who was career army and served in the Korean War. He won't talk about the war, but he has told some funny stories about his post-war army experiences. I've written those down and am hoping he'll open up about other things someday. My father was also a WWII vet. He served in several different places, including the Aleutians, as a weather forecaster in the Army Air Corps. He fortunately was not in combat. My father-in-law was an Army Air Corp pilot and served in the Pacific. I think the Wharton County, Texas DAR recorded his war memories as part of a national project. I don’t have any family veterans still alive but we still have a couple of friends who served in WWII. Pat, that Texas DAR project sounds wonderful! I wish more organizations would do something like this. Please take the time to talk to your WWII vet friends about their war experiences. Bring a recorder along so that you can preserve their stories in their own words to share with others - before it's too late. My father-in-law, who died ten years ago, was in the Navy during WWII and in lots of major battles. He lied about his age, as he was too young, to join up, and the reason he joined up when he did is that his older brother, already in the Pacific, was captured and taken on the Bataan Death March as a prisoner. Lucky for us, my daughter had a high school project in which she was to interview an older relative or acquaintance about his/her involvement in WWII and their life. She chose her grandfather, my FIL, and we have both a recording of his story and a written account completed by my daughter. Jackie, your father sounds like he was an amazing person, and Jacqueline sounds like a book that all those interested in WWII should read. And, I, too, worry about pattern of young people not learning about our history the way they should. What a wonderful remembrance for your daughter (and the rest of the family) to have of her grandfather! Kudos to her high school teacher for coming up with such a meaningful project. I wish I'd had a teacher like that when I was in high school. It would have made me aware of my dad's military history much earlier and would have made my book research a lot easier. And you're right about my dad being an amazing person - he was, but I'm fairly certain most children think that about their fathers. I miss him every day. What a wonderful legacy. I am so glad your dad encouraged you to write his story. I am ever awed by the sacrifices made globally during the first and second world wars. My grand uncle was a Commander in the Navy during WWII. He had stories but like your father he rarely shared the difficult ones, preferring to talk about the friendships made and the kindness of others. Your dad sounds so much like him. Jenn, if you can remember his stories, I'd encourage you to write them down and share them with the younger members of your family. It's difficult for my children and grandchildren to imagine the world my parents' generation lived in. I hope these stories will instill in them a sense of gratitude so they'll appreciate what it took to secure the freedom they enjoy today. The National World War II Museum in New Orleans https://www.nationalww2museum.org/ tells the story of the American experience in the war. This map https://www.nationalww2museum.org/sites/default/files/2017-07/July-2017-Campus-Map_0.pdf gives an idea of the breadth of detail and immersive experiences at the museum. Thanks for the tip, ReaderKay. I'll be in NOLA next month, and I'll definitely check this out!